Marvel 1971 Third Eye #4019 KRAKK! IRON MAN Black Light Poster (Iron Man). You won't find one Nicer. This poster is Guaranteed 100% Authentic and original. Measures 33" x 21.5". We recently obtained a large collection of comics! Please view the photos because you will be receiving EXACTLY what is pictured! Please see the photos for your own reference. If you have any questions, please ask. Please see the photos for better details on the item. Use the enlarger to see EXACTLY what you will be receiving. This is the exact item. If you have Any questions please ask! 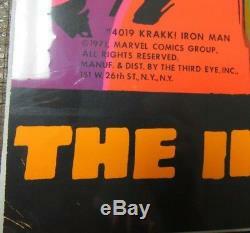 The item "Marvel 1971 Third Eye #4019 KRAKK! 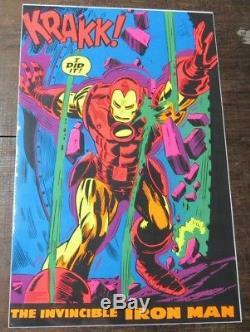 IRON MAN Black Light Poster NM-MINT A004" is in sale since Thursday, September 13, 2018. This item is in the category "Collectibles\Comics\Posters". The seller is "jaybird8325" and is located in Flint, Michigan. This item can be shipped to United States, Canada, Mexico.